A box, some red paint, fiber optic hair clips (2 with the clip put into the corners and the optics spread out) onto a piece of Plexiglas , the almost transparent foam wrap (like the kind that a lot of LED TV or lap tops come wrapped in), and a piece of cardboard cut into a rectangle and spray painted silver completed iPod’s window. Plexiglas was placed on the outside of the box with opening cut out of box so it allowed optics to shine). Some felt (in this case, red), to protect neck from cardboard chaffing and to cover arm flaps if arms were pulled in. A piece of white foam board (thin so it doesn’t stick up too much base of iPod) cut into a circle, pen to create symbols on the dial-gave the look of a button. 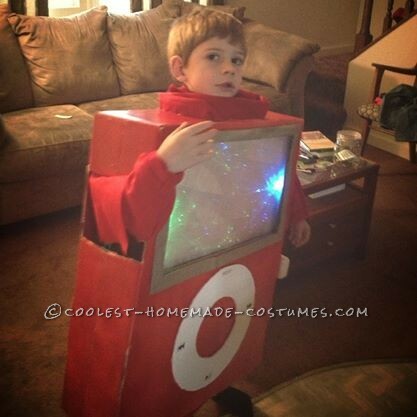 A white portable speakers hooked to the left side of him, went to an actual iPod taped inside the box, so iPod played music (not loudly but enough to get the point). He won 2nd in the costume parade at a local church done in age groups (his was 5-7 year olds) and was beat out by a cool look race car boxed costume (must have been the year to use boxes!). The box made it really hard to walk up stairs and down. We ended up (by the fifth house), cutting slits into the back of the box to allow movement of legs to bend some but knees kept hitting the front.